As the most popular page on a higher education website, the campus map should give prospective & current students the tools necessary to navigate the campus and get a glimpse of everything your college or university has to offer. Your interactive virtual tour or interactive campus map must be a compelling and impressive statement about your college or university captured in a dynamic way. Third Wave Digital is your partner in designing and developing a one of a kind interactive map or virtual campus map experience. To make navigating your online campus tour informative and engaging, we utilize our expertise and years of experience to make your college’s interactive campus map come to life. By combining photo-realistic images and customized illustrations with the latest interactive technology, our interactive campus maps make it easy to showcase buildings, common areas, residential spaces, learning facilities and so much more. Using the latest technology to manipulate artistic renderings, photographs and the standard maps to offer an immersive, interactive campus map experience. Allowing users to pinpoint the areas easily by using real aerial imagery blended with color coding. Presenting more photographs and information about particular buildings on your campus. 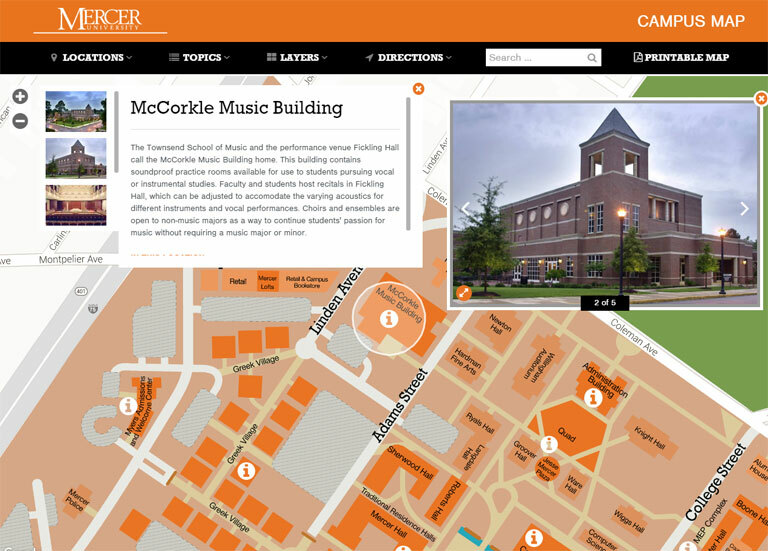 Expertly incorporating the campus map into your college website and/or admissions website. Keeping compatibility in mind to make your school's map a mobile campus map. See more interactive campus maps here.